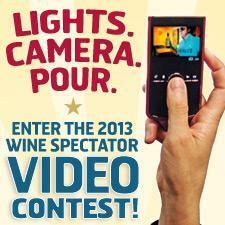 Submit your video to Wine Spectator's Seventh Annual Video Contest. Make it short, educational and entertaining. Storytelling is in; straight-on commercials are out. Everyone can enter—whether you're a wine lover, wine region rep or a winery, retailer or sommelier, rapper, lawyer, chef or videographer—as long as you are at least 21 years old. Become a star! Your video will have a big, big audience on WineSpectator.com if it is selected as a finalist by our editors. The public picks the winner. Great prizes for all qualified entrants and finalists. Finalist Prize The finalists will each receive a pair of tickets to one of the Grand Tastings at the Wine Experience in New York City on October 24 or 25, 2013. If they are unable to make that date, finalists may attend any one of the 2014 Grand Tour Tastings (dates and locations TBD). For examples and inspiration, check out last year's finalists. The winning video, "A Brief History of Merlot," continues the humorous, storytelling approach to wine that has attracted the popular vote. Read the story behind this video. Videos must be less than three minutes long and may not contain any copyrighted or defamatory material. View the complete contest rules, prize and submission information. Got questions? Email us at video@winespectator.com.